In 1959, the short-lived (2 years in production) original Speedmaster reference, the CK 2915, got something of a makeover. The result was the reference CK 2998, currently the second most desirable vintage Speedmaster. Powered by the calibre 321, it was – just as the 2915 – intended as a watch for drivers (racing drivers included), and marketed as such. With its dashboard instruments inspired dial, clean and uncluttered, it was a very appealing design. Appealing enough to a US Navy pilot, captain Walter Schirra, who in 1959 became a part of NASA’s very first manned space flight program, the Project Mercury. In 1962, Schirra’s own CK 2998 accompanied him on an almost 10 hours of the Mercury-Atlas 8 mission, when aboard the Sigma 7 Schirra orbited the Earth 6 times. All of the CK 2998 versions share some key features, however of all the pre-Moons, the 2998 seems to have the most differences between all of its versions made between 1959 and 1962. All the 2998s featured a “straight lugs” steel case, with a “double step” case back, engraved with the Speedmaster “hippocampus” logo. 4x3mm pushers, 7mm crown. 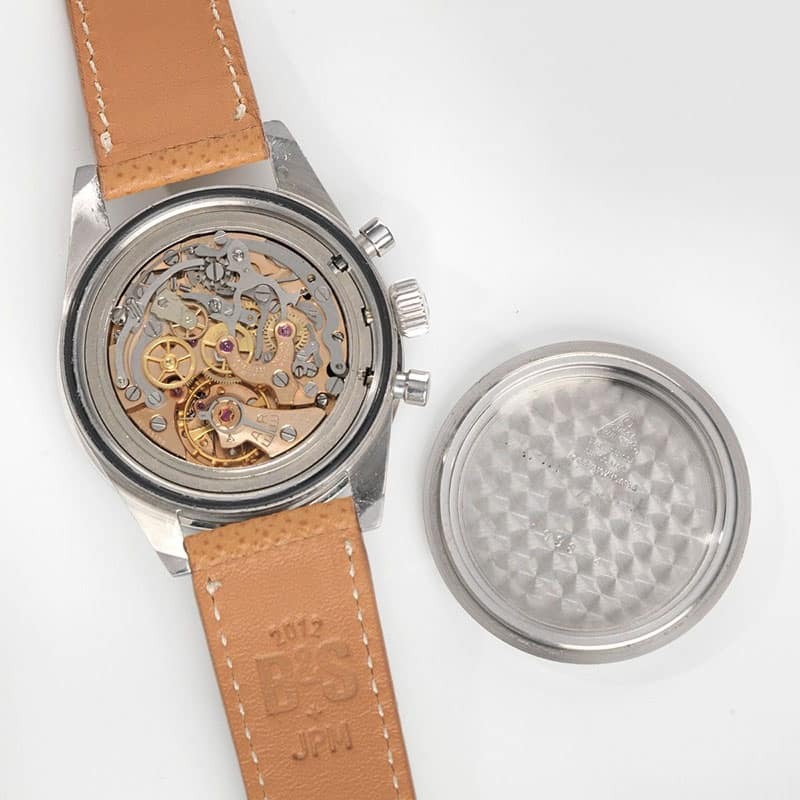 There were two types of bezels used on the 2998 – the TACHYMETRE BASE 1000, seen only on the 2998-1 and 2998-2, and the standard DON, seen on the vast majority of Speedmasters from the 2998-3 to 145.022-69. The BASE 1000 is rare – spares are impossible to find, and even specimens of the -1 and -2 with knackered bezels of that type fetch absolutely wild prices. Way above what they would sell for with a replacement DON. While in the Speedmaster collection the alpha hands were first used on the 2915-3 (the only 2915 without the broad arrow hands, at least in one of the two executions of the 2915-3), the 2998’s alpha hands are not identical to the ones found on the 2915-3. The hour hand on the 2998 is noticeably shorter. The most common type of the chronograph seconds hand used on the 2998 was a straight chronograph seconds hand, without a lume plot. However, the first three versions were also equipped with the rather uncommon “lollipop” hand, with a big, round lume plot. The 2998-5 was the first Speedmaster to be also equipped with a spear chronograph hand, as seen on all the Speedmasters until the introduction of the square-end spear circa 1967. The 2998-6, -61 and -62 always had a spear chronograph hand. The 2998-1, -2 and -3 and -4 were equipped with white (painted) alpha hands on the subdials. All the versions that followed had the white baton hands (installed on almost all pre-Moons and Moonwatches, from the 2998-5 until the currently produced Pro). 2998-1 and 2998-2 had almost identical domed dials, with – just as all the 2998s – the wide “Oval O” Omega font used, and short markers on the subdials. From 2998-3 on, step dials with longer subdial markers were used. As in all the pre-Moons until the 145.022-69, the hour markers were long, reaching the outer edge of the chapter ring. No “Professional” inscription, no tritium markings. As in the vast majority of pre-Moons (except the 145.022-68 and early -69), the 2998 is powered by the calibre 321. Worth noticing is the symmetric clutch bridge. An asymmetric one would be out of place in a 2915 or a 2998. That would suggest at best a replacement part, and at worst- a frankenwatch. These two are almost identical, save for the reference (and that the 105.002 had a version with all hands baton). 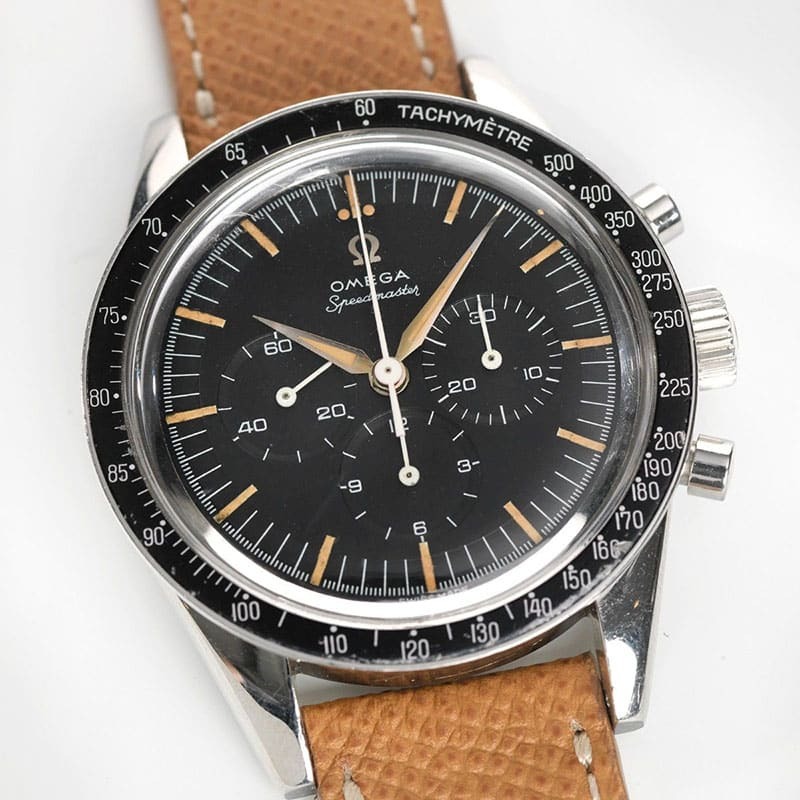 In the early 1960s, Omega was switching from the 4- and 5-digit reference number system to the 6-digit one, separated by a dot in the middle, where the first three digits represent certain features of the watch. The chart explaining the meaning of particular numbers in the 6- and 7-digit reference number system can be found here. The 2998 is an absolutely beautiful watch – in all of its versions. 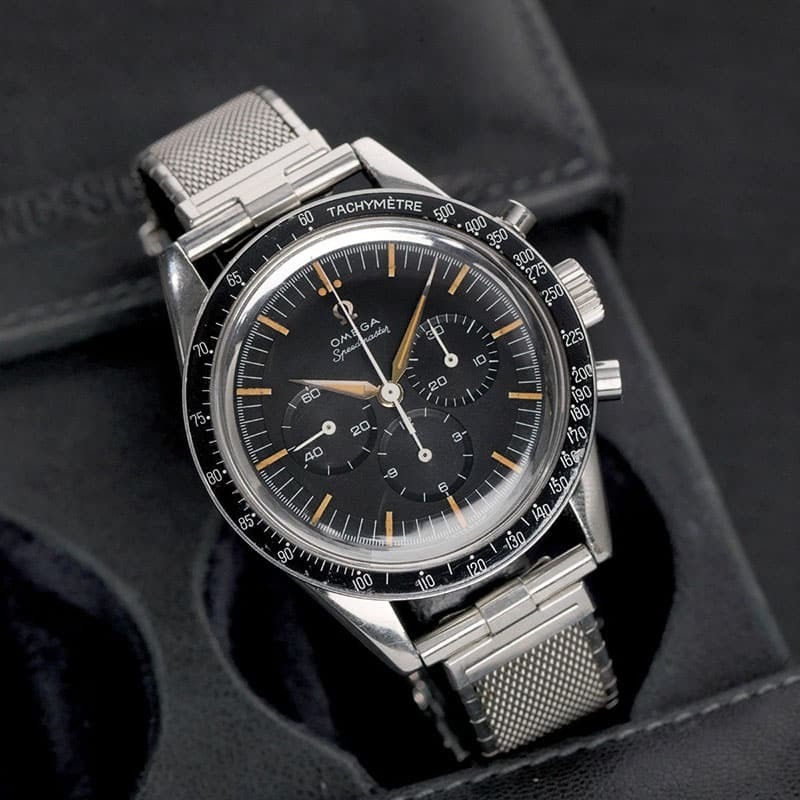 However, merely the fact of it being an early Speedmaster, rare or not, has driven the prices for the most common on them into somewhere between the stratosphere and the edge of space. The prices range from $25,000 to $55,000, which is still less than the specimens issued to the FAP (Fuerza Aerea del Peru). These surface quite rarely. If the 2998 is far out of your reach, or far beyond your definition of “reasonable”, there’s always the 105.002 with the alpha hands. However, these are anything but accessible, they’re not common, and they don’t come up for sale particularly often. Recently, Omega has released a CK2998 Limited Edition…which doesn’t really look like a 2998. In theory, the straight lugs are there, the BASE 1000 bezel is there, the lollipop chronograph hand and the alpha hands are there. It should be a good tribute to the model, and it all sounds good… Only the bezel is made of dark blue ceramic, and the dial is an off-white/silver and navy blue “panda” one. That said, there’s hardly any 2998 left in that 2998. That leaves the contemporary tribute to the 2998, the “First Omega in Space” numbered edition. It features the straight chronograph hand, the alpha hands, the applied logo, as well as the long hour markers on a domed dial (just like the 2998-1 and -2). The chapter ring is different, and the handset is somewhat strange – painted batons (and the straight chronograph hand) are for the chronograph features, steel alpha hands were used for the hour, minute and sub-second hand. The “FOiS” features a sapphire crystal, which some don’t mind. Others criticize it for the “milky ring” effect between the edge of the dial and the bezel. However, that’s as close as you can get to the 2998 without spending a fortune.